It wul hab 2 be chaynjd! Dis wun nawt meet teh noo regoolashunz. Nuffin duz, akshully. Congas, anni! Thx, AP! An u 2 awlso! Yep, dey chaynj teh roolz az sune az u bye teh laytist bershun! Needs moer likks, but ai nawt duin it. heers teh burfday fairy to say HAPPEE BURFDAY to Stagehanddan (hooz burday iz sumtime in Febooary, top sekrit), Superpizza , Mitsubachicats, Saaski, freddycatmeow, ToonaJoosePlz an evreewun else hoo haz a burfday today! i haz bringd yummy fudjy burfday caeks, wite caeks wif fluffy lemmin frosting, iskreem, sparkly party punch, fansee shiny party hats, an goodie bags filled wif frizbeez that glo in teh dark, itty bitty sekrit notebuks, kandee, an glo-in-teh-dark funny face stikkers! an a big swish ob teh burfday wand to making all yor burfday wishes come troo! it�s yer burfday, it�s troo! Happi birfdai TJP and SHD (miss u!) an ebriwun els wiv a birfdai 2dai. Haow appropriate this LoL iz. Mai Mom hazzn’t bin ab lol to drive forra munth. Ai tuuk hurr car owt today adn got a tikkit for overdoo inspekkshun. Went to teh garahzh, got a ninspekkshun adn mebbee tomorrow go to court to plead mai case. Fun thymes! Thnx b_f for teh treets adn wishes! awww teh bakry man hittin awn yu an sugarin yu up wifa kookie, ai lyke that! whoo hoo it is toonas burfdai!!! happie burfdai mai deer fren! An nyse tew spend wif momcat sinse yu boff kinda shaer this dai. all rite nao peeps allemanndie leff!!! 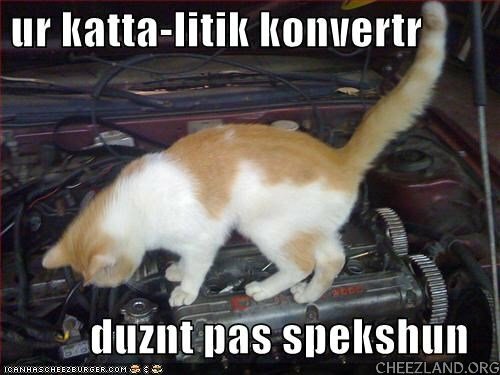 Also yu need all noo filturs so yr car can breethe bettur an not koff koff koff. hee hee hee….dis kitteh luks lyk mai Murphy boi, septin that dis kitteh has “nerml” eers and Mr. Murphy has teh foldie eers… dis am his colors ed zachary! Happie belaytid birfday greetings to TJP and Stagehand Dan, wherebber yu mai be…..